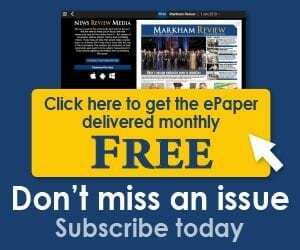 Intricate, hand-carved ice sculptures are on display at the Markham Ice and Snow Festival. The festival will be available for free to the public from Feb. 9 to 18. Visiting hours are from 9 a.m. to 10 p.m.
Join the City of Markham and the Centre of Sustainable & Integrated Design (CSID) at the Markham Civic Centre on Feb. 9 for a live ice sculpting demonstration at the opening ceremony. Xiaodong Zhu is one of ten award-winning artists from Harbin, China who has travelled to Markham to be a part of the special event. Among his many titles, Xiaodong has been called the “master of ice and snow art” by the Harbin People’s Government. Ten international artists have carved 14 ice sculptures with a theme of A Romance of Ice and Snow. There will also be an outdoor maze carved entirely from ice for children to explore. 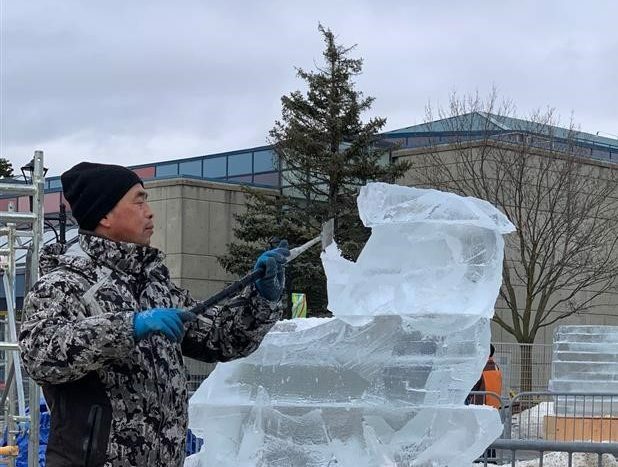 The Markham Ice and Snow Festival, presented in co-operation with the City of Markham and the Harbin People’s Government, is inspired by the Harbin International Ice and Snow Festival, known around the world for its stunning display of ice sculptures. Not only will the festival introduce Markham and the Greater Toronto Area to one of the greatest winter festivals around the world, it will also provide a platform for Canadian and Chinese artists to display their work, and further promote the municipal friendships between the City of Markham and the City of Harbin, China. Photo: An artist hand-carves ice sculptures outside the Markham Civic Centre for the Markham Ice and Snow Festival.